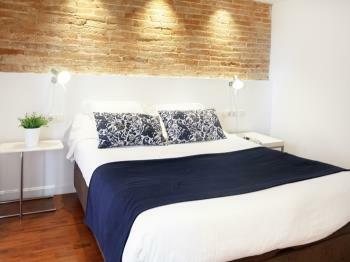 The Sagrada Familia apartment (HUTB-001044) is located on the first floor of a small building. 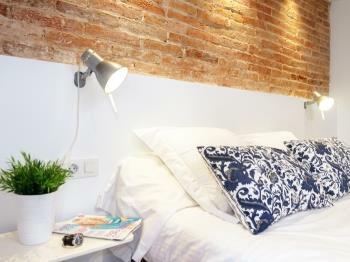 The main bedroom of this Barcelona apartment has a queen size be and a small balcony facing the interior courtyard of the block. 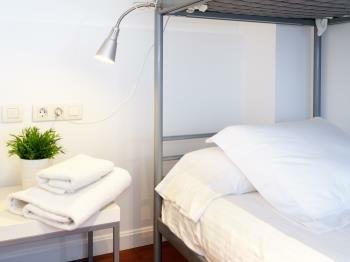 The second bedroom comes with a bunk beds, ideal for children. The living area and the kitchen share the main space of this apartment. 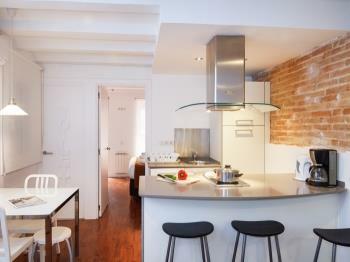 The kitchen is new and modern and comes fully equipped for self-catering holidays. 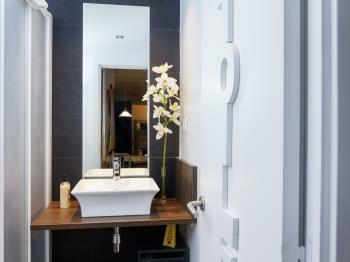 There is a bathroom with a modern shower and equipped with a hairdryer. 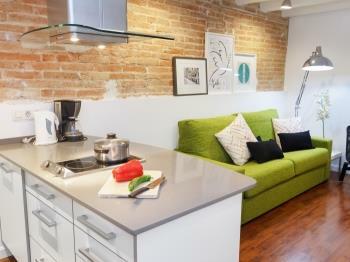 This apartment in Barcelona is ideal for a small family looking for a stay away from the hustle and bustle of the busy Old Town district. The apartment has two bedrooms. 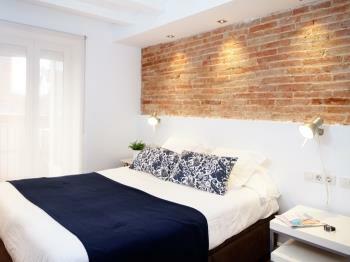 In the master bedroom you will find a double bed and access to a small balcony overlooking an inner courtyard. The second bedroom has bunk beds. The central space is occupied by the open concept kitchen fully equipped, a dining table with chairs and a space of living area with a convertible sofa in double bed. 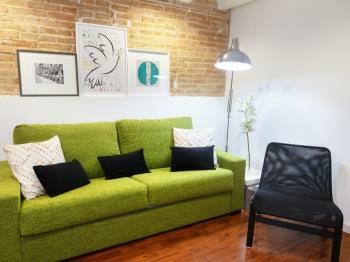 In the apartment there is free Wifi, air conditioning / heating and a washing machine. The bathroom has a shower with a shower stall and there is a hairdryer. The building does not have elevator, the apartment is located on the first floor. We will only be present during the check-in. 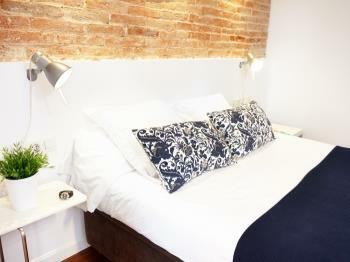 A 24h contact phone number will be reachable during your stay. You can also send us your queries by email. 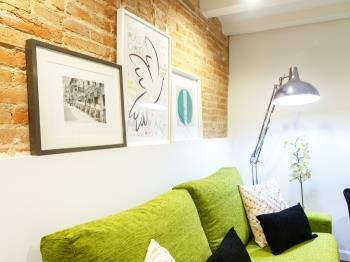 The apartment is located on a quiet street of the Sagrada Familia neighborhood. 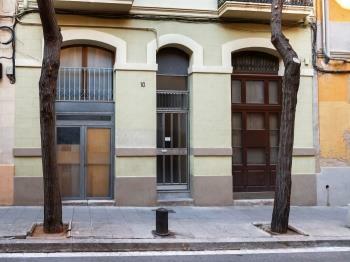 This neighborhood is one of the most representative of l’Eixample district, which reflects perfectly the modernist architecture of Barcelona. Another of the attractions of this neighborhood is the Gaudi Avenue, a semi-pedestrian street full of shops and bars and restaurants terraces that connects with the Hospital de Sant Pau, another modernist building that has a monumental part to visit inside. Barcelona is a fairly flat city, so you can easily reach on foot or by bike to many of the city's sights. However, if you wish to use the public transport, the area is well served. Next to the apartment there is a metro stop where you can take 2 lines (L2 and L5). In addition there are several bus lines. 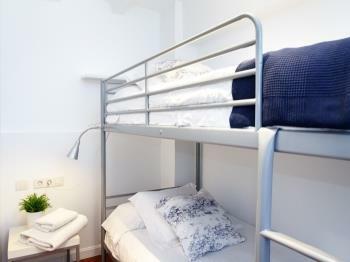 You can also take the Tourist Bus just 200 meters from the apartment. 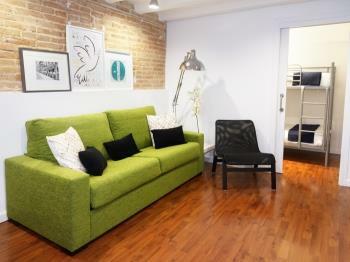 The Sagrada Familia apartment (HUTB-001044) is located on the first floor of a small traditional building that has been recently refurbished. It has preserved the structure and details of the building that respect its traditional charm and have incorporated modern facilities and practical furniture to make your stay as pleasant and comfortable as possible. This apartment has two bedrooms. The master has a double bed and exit to a little balcony facing an inner courtyard and the second bedroom has bunk beds. In the central space are joined the open concept kitchen with the living room, where there is a comfortable sofa bed for 2 people. There are high stools in the kitchen bar and a table with chairs to eat. The kitchen is fully equipped with modern appliances and utensils so you can prepare your meals at home. In the lounge there is a television. The bathroom is small but practical. It has a shower with a rigid screen and there is a hairdryer. The best thing about this apartment is its location: just 2 minutes walking from the Sagrada Familia and at the same time in a nice quiet pedestrian street.